RALEIGH, N.C. (WTVD) -- The process of drawing district lines in North Carolina has seen its fair share of criticism. Now, three democratic senators have introduced a bill that they hope will change that. "We don't want to dilute the power of the people," explained said Curtis Hill, Columbus County Forum. "We want the people's voices to be heard." A bill was introduced Thursday that would eliminate politically charged gerrymandering -- the process of dividing a region in a way that gives one political party an unfair advantage. Regular voters would have the power to draw district lines. "It puts voters, not politicians, at the center of a fair and open process to draw our confessional legislative districts," said Jennifer Bremer, League of Women Voters of North Carolina. The bill creates a 15-person citizens redistricting commission. Anyone could apply but there are strict requirements. Candidates cannot have any affiliation with politics but they must be registered voters. "There's a lot of eligibility requirements to try as best as we can to weed out political people who have served on committees or big campaign donors," said Brent Laurenz, Common Cause North Carolina. Right now, legislators are in charge of drawing district lines after the review voter data, which allows them to manipulate districts in a way that could be beneficial to them or their party., but supporters are hoping this bill will change that. "Democrats were not right, my party was not right when we did it and the Republicans are not right doing it now," said Senator Erica Smith, D-3. "It is unfair to the people of North Carolina." Other states do have these citizen commissions who draw district maps. Senator Ralph Hise, R-Mitchell, who chairs the Senate Redistricting and Elections Committee, said, "Liberal activist group Common Cause is currently leading a ridiculous lawsuit against the General Assembly, pretending their goal is 'fair maps.' Their appearance at today's press conference reveals Common Cause's true motives: to help Democrats give themselves more power. "This phony commission they're promoting uses the same strategy as their lawsuit," he continued. "Ask a group stacked with Democrats to draw new maps that give Democrats a majority. 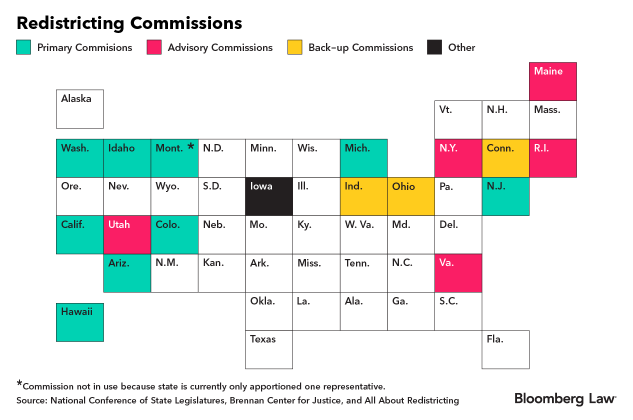 If their goal is nonpartisan redistricting, then why create a commission that gives Democrats control over everything?" California had over 30,000 applicants the first year it was implemented. New Democratic Gov. Tony Evers has proposed in his budget a different process for 2021. Under it, a nonpartisan legislative agency would redraw the maps and then submit them to the Legislature for an up-or-down vote, with no amendments. Several people supported the idea at a recent public hearing on Evers’ biennial state budget proposal in Oak Creek, including Nancy Kaplan. She points to a 2019 Marquette Law School poll, which she says shows redistricting is a nonpartisan issue. Kaplan says, “72 percent of voters prefer redistricting of legislative and congressional districts by a nonpartisan commission." Evers’ plan is based on the method that Iowa has been using since 1980. And, while those testifying at the state budget hearings are looking ahead a few years, the federal trial this summer would judge the way the 2011 maps were drawn — and possibly order them reconfigured by the 2020 presidential election. One group interested in the outcome is Common Cause in Wisconsin. Executive Director Jay Heck says he hopes the judges throw out the current maps. “They were drawn in such a way that it made it impossible for people who voted for one political party to ever see a majority of that party gain control either in the Legislature or in Congress, because of the way that one party was packed into a district and the other party was spread out so as to assure victory,” he says. The challenge was originally brought by a handful of Democratic voters in Wisconsin. A panel of federal judges struck down the Republican-drawn maps in 2016, and the GOP appealed to the U. S. Supreme Court. The high court sent the case back to the federal court in Madison, saying the plaintiffs lacked legal standing, and failed to prove that individual rights were violated. Rick Esenberg is an attorney for the Wisconsin Institute for Law and Liberty. It has previously filed “friend of the court” briefs in the case. Esenberg argues the current maps are constitutional, because they reflect the relative concentration of Democratic and Republican voters geographically. “In the state of Wisconsin and in many other states, the Democratic voters tend to be more heavily geographically concentrated than Republican voters. The plaintiffs say it’s too much, but the problem is that there’s no standard to determine how much is too much,” he says. The U.S. Supreme Court recently heard arguments in two other cases: North Carolina, where Republicans are accused of overreaching and Maryland, where a lawsuit has been filed against Democrats who oversaw the redistricting process. The court is expected to rule in those cases by the time Wisconsin’s trial begins in July. UW-Madison Political Science Professor Barry Burden says those rulings could have an impact on the state’s case. “If the court for example, were to rule in a majority opinion that the Maryland and North Carolina districts should be redrawn in some way because they violated some constitutional rights, that might lead to a remedy being proposed in Wisconsin without a full trial. If the Supreme Court instead issues a kind of mishmash of different opinions without a clear majority on one side or the other, the trial might go forward trying to resolve some issues that didn’t come up in the Supreme Court opinions,” he says. Burden says there have been many redistricting lawsuits since the 2010 Census. The most noteworthy outcome came from Pennsylvania, where its state Supreme Court last year, struck down maps that Republicans had drawn. The court ended up redrawing the boundaries. Long Island and the state as a whole are at risk of failing to count all residents for the 2020 U.S. census, advocates said Friday, citing problems ranging from too few dollars for outreach to the chilling effect of anti-immigrant rhetoric and policies. Long Island communities that are deemed “hard to count” tend to have sizable numbers of renters, sometimes in unregistered group homes; recent Hispanic immigrants; children under 5 years old; and households that lack computers or internet access, they said, noting next year’s census will be the country’s first with an online form. The bipartisan New York Complete Count Commission delved into these and other difficulties at a hearing Friday at Suffolk’s legislative chambers in Smithtown ahead of next year’s census, which will decide how states share billions of dollars of federal funding and the size of their delegation in the U.S. House of Representatives. New York State earmarked as much as $20 million to persuade New Yorkers to participate; the Fiscal Policy Institute last year said $40 million was needed. Though California’s population — at almost 40 million — is roughly double New York’s, the Golden State’s website says California plans to spend as much as $150 million on outreach. Freeman Klopott, a spokesman for the New York State budget, said the state is committed to a complete count, citing efforts to update a federal master list with addresses it lacked, and to work with local groups. A spokesman for Gov. Andrew M. Cuomo had no immediate comment on whether more outreach funds were needed. Though the answers on census forms remain with the organization that collects them and are not shared with the government, Rebecca Sanin, CEO of the Health and Welfare Council of Long Island, pointed out that some immigrants are too afraid to even apply for food stamps or Medicare. “In an anti-immigrant climate, we need to be concerned in a way we never have been before,” Sanin said. This is why it is so crucial to recruit trusted local leaders to serve as census ambassadors, the experts said. “They talk to us, they trust us,” said Shanequa Levin, founder of the Women’s Diversity Network, before the session. Libraries, schools, community centers, houses of worship, food banks and other places people gather all must be enlisted, they said. “If our communities are unaware of the need to participate, there will not be an accurate count, and unmet needs will abound,” said Claire Deroche, speaking on behalf of the social justice committee for the Unitarian Universalist Congregation at Shelter Rock. Undercounts in the 2010 census cost New York two congressional seats, advocates said. Vanessa Baird-Streeter, Suffolk County assistant deputy county executive, highlighted other problems that arose. For example, she said, a school district was forced to spend hundreds of thousands of dollars renting a building that it could not anticipate it would need because so many prekindergarteners were missed. There also remain several other open questions about the process, including how independent the redistricting commission will really be and whether the districts it draws will ultimately be approved by the Legislature and Governor. In the last two rounds of redistricting, the Legislature deadlocked on congressional maps and both times, a judicially appointed special master ended up drawing the maps that were later adopted. Florida is about to win. And Central and Southwest Florida might win even more. Less than a year out from the 2020 U.S. Census, analysts project the state to gain two additional seats in the U.S. House of Representatives (and, correspondingly, the electoral college). So while states like New York and Ohio continue to see their population and corresponding congressional representation dwindle, Florida, Arizona and Texas are looking for gains. But the apportionment set by the federal government (due by the end of 2020) is only the beginning of the next step: redistricting. Florida’s Legislature is charged with drawing the new maps. That effort (which ultimately took more than two years after last decade’s count) will depend on partisan demographics and political strategy. But at the heart of it, supposedly, is where people live. All Congressional districts are supposed to be “as nearly equal in population as practicable.” That means we should expect general areas with relatively more people than 10 years ago to get more representation. Geographically, we’re talking Central and Southwest Florida. Population total trends show, since 2010, Central Florida has seen less of a boom and more of an explosion. In particular, Florida’s Ninth district (including Kissimmee and Winter Haven) has become a behemoth. If the population in each district in Florida were the same, each would hold about 777,200 people, as of 2017(the most recent American Community Survey data available). The Ninth was home to 868,945 people that year, 12 percent more than expected. Those 91,000 extra people (about the population of Miami Beach) get no extra representation in Congress. The next-largest population districts are the 10th (in neighboring Orlando), 16th (Sarasota), 19th (Naples). Nothing is anywhere near certain. It’s still a year before the Census and two years before Florida gets the data it uses to redistrict -- and the American Community Survey data is already more than a year old. What comes next will be an entirely different map. But when the dust is settled, every new district’s population will be the same size, meaning the districts where residents lose out now (in Central and Southwest Florida) will regain equal representation in Congress, momentarily. "The unreasonableness of Defendants' addition of a citizenship question to the Census is underscored by the lack of any genuine need for the citizenship question, the woefully deficient process that led to it, the mysterious and potentially improper political considerations that motivated the decision and the clear pretext offered to the public," wrote U.S. District Judge George Hazel of Maryland in a 119-page opinion released Friday. This latest district court ruling in the almost yearlong legal battle is likely to be appealed all the way to the Supreme Court. Gerrymandering, or Geography? Computer-based techniques can prove that partisan advantage isn’t an accident. Legislative redistricting is one of the most important — and most contentious — issues in Wisconsin. Voters and democratic theorists alike are uncomfortable with the idea that lawmakers can choose their own voters in increasingly precise ways. The current district lines are in the midst of a legal battle that went all the way to the Supreme Court, which declined to decide the case on technical grounds. A new case is currently awaiting a trial date. At issue is what supporters of the lawsuit call the efficiency gap, the difference between the number of votes a party gets and the number of seats it wins in the state legislature. In Wisconsin, the gap is historically inefficient — evidenced by Republicans winning 46 percent of legislative votes and 64 percent of legislative seats in the 2018 elections. Gov. Tony Evers, a Democrat, recently proposed that Wisconsin create a nonpartisan redistricting commission, suggesting an independent process for the drawing of legislative lines that looks more like Iowa’s — a state often referred to by redistricting scholars as the “gold standard” in representational fairness. Our Communication and Civic Renewal research team at the University of Wisconsin-Madison asked 1,015 Wisconsinites who they thought should control redistricting in our state: the state Legislature or an independent, nonpartisan commission. Fifty-three percent of adults said they preferred the nonpartisan commission while only 13 percent favored the idea of state lawmakers controlling the process themselves. The remaining third said they did not know what was best. Perhaps not surprisingly, given that the current district maps benefit the Republican Party, 63 percent of Wisconsin Democrats want a nonpartisan commission to take over the drawing of representational lines. Fifty-six percent of independents side with Democrats while 39 percent of Republicans want to see a change to nonpartisan redistricting. However, only 22 percent of Republicans want to keep things as they are, as compared to just 6 percent of independents and 9 percent of Democrats. Of course, one reason redistricting is so complicated, and contentious, is that an equal number of voters must live in each district even though voters do not live in such a way that they are spread equally across the geography of our state. Even so, rural, suburban and urban Badger State residents favor a nonpartisan redistricting commission to the current policy in relatively equal measure. We also asked people to think about what the results of a fair redistricting process would look like. The average response from Republicans, Democrats and independents alike was above the midpoint, suggesting that Wisconsin voters’ sense of fairness is such that the party that gets the most votes should have a legislative majority. However, there were some differences in how much partisans agreed with this notion of representation. Specifically, 66 percent of Democrats in Wisconsin were most supportive of the idea that the number of votes a party gets should directly translate into more legislative representation for the winning party, while 55 percent of Republicans and independents alike gave the same answer. Geographic differences on this question did not show up in our data — the average difference across rural, suburban and urban adults in Wisconsin was 0.01 on that five-point scale. One reason redistricting is so important is that the majority party in each legislative chamber has great power to determine how much voice the minority party has when it comes to legislating. Extending rights of participation to political minorities is crucial for the maintenance of democratic corms of government. To that end, we asked Wisconsinites how important is it that electoral winners allow electoral losers to continue to have a voice in government. Wisconsinites strongly favored this idea as well — to the tune of 84 percent support. Notably, partisan differences on giving political minorities a voice diminished significantly. More than three-quarters of Republicans supported the idea; more than eight in 10 Democrats and independents did as well. Once again, differences between rural, suburban and urban Wisconsinites were not present in the data. No matter where they live and what their communities are like, Wisconsinites have similar views about basic fairness in politics. Regardless of what the courts eventually decide, Wisconsin voters favor a nonpartisan redistricting commission and lawmakers who will make sure that those in the political minority are not rendered voiceless by the majority.